Ages 4 to 8 years. A graceful retelling of the story of Jesus' birth in Bethlehem. Old Mrs Dove has a story to tell, and all the animals in the barn are anxious to hear. Through her tale, we learn of the arrival of Mary and Joseph in Bethlehem, the birth of Jesus in the stable, the appearance of the angel to the shepherds, and the journey of the wise men to meet their new-born King. And most important of all, we learn that Christmas is really about God s great gift of His Son to all of us. 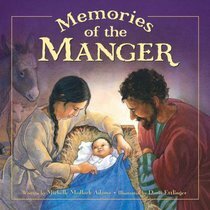 About "Memories of the Manger"
Michelle Medlock Adams graduated from Indiana University with a degree in Journalism and began her career as a newspaper reporter for a daily newspaper, earning many writing awards from the Associated Press, the Hoosier State Press Association and the Society of Professional Journalists. Today, she is a full-time mum and freelance writer, who writes for numerous magazines such as HomeLife, American Cheerleader, Light and Life Magazine and Writer's Digest. She is also the author 32 books including women's devotionals, Christian Living titles and 22 children's books.